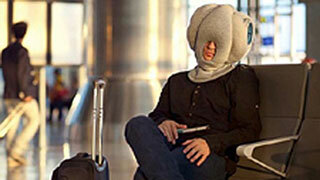 The Ostrich Pillow. You look ridiculous. Remember the Ostrich Pillow? It promised to help travellers counter the ill effects of jet lag and long-haul flights. There was a catch, however. It made you look completely ridiculous. The airspace for plane pillows is as crowded as the skies. The inflatable horseshoe pillow has been around for decades. A few years back a former Virgin Atlantic flight attendant invented a J-shaped pillow. Now an Israeli-American entrepreneur and his ‘geek’ business partner have produced the latest entry. It’s still a little weird, but it won’t make you look like a caterpillar. ‘JetComfy’ weighs less than a pound and measures 9.5-by-5.5 inches. It looks nothing like a pillow - more like a foam headrest attached to a foot-long pole supported by the arm of your seat. The product got its genesis when entrepreneur Ephi Zlotnitsky flew off for a diving trip with his wife to Bora Bora in 2014. As they were exiting the Air Tahiti jet, he heard a passenger named David Brecht, a battery engineer from San Diego, call it the "worst flight ever." At the hotel bar later, the two decided to team up to bring restful sleep to those who can't afford to buy spacious biz class seats. Zlotnitsky's idea was to re-create the comfort of your chin resting in the cup of your hand with your elbow resting on the desk or table. "Dave is the geek that can take my ideas and make it happen,” Zlotnitsky told the Washington Post. “I am the guy taking it to the business. We spent almost two years building this crazy thing." "Airlines are cramming you in and there is less space and less everything," he said. "At least you want to sleep normal." About 10,000 units have been sold since Jet Comfy went on sale in January. Zlotnitsky said he has plans to open the first JetComfy comfort sales centre in Dulles International Airport in August and hopes to expand to 25 locations at larger airports in a year. The pillow is available now on Amazon Prime and at Luggage Plus stores and will be offered online by Walmart later this month.